How do you install the steps? 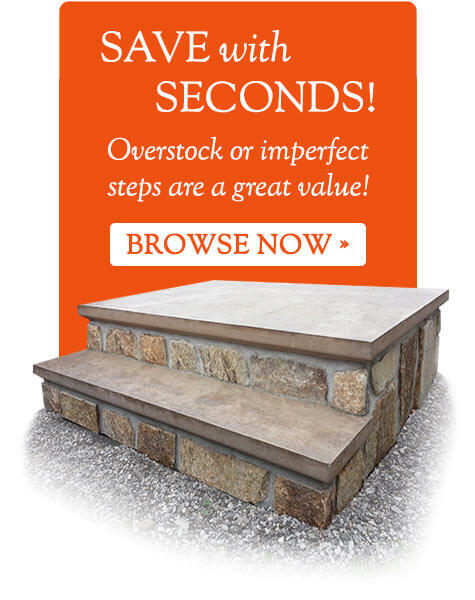 Standard installation is included with the purchase of one of our steps. The crane truck will deliver your new step and install it by using angle irons bolted into your poured concrete foundation. The front portion of the step is centered on free floating patio blocks. If your home’s foundation is on cinder blocks, the new step will be installed free standing as cinder blocks cannot support the angle irons with the weight of the step. Do you remove my old steps? Yes. We are capable of removing your existing steps prior to the time of Installation of your new ones. It takes just a few hours to install a standard step. Do you need a permit to install the steps? Can you repair my existing steps? We do not repair steps. We recommend you contact a mason. Can I just buy rails or do I have to buy both rails & steps? You can purchase rails separately for your steps, and in some cases we can make custom railings. Contact us for details. Yes, we offer a 3 year warranty covering defects in quality or workmanship. The use of salt/sodium chloride will void the warranty. We accept checks and credit cards. We ask for 25% deposit prior to ordering the step and the balance in full on day of delivery.